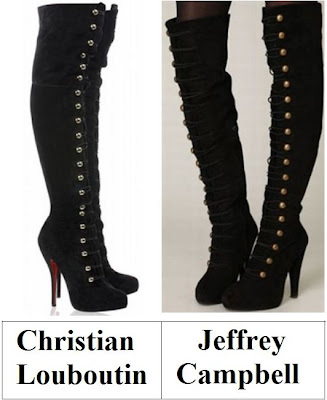 Mon doux, in the left corner you will find Christian Louboutin’s saucy Supra Fifre 120 Thigh-High Boots – the very same stunners seen on Jennifer Lopez, Carine Roitfeld, Ciara, Fergie, Khloe Kardashian, and Kylie Minogue; in the right corner take a peek at Jeffrey Campbell’s blissful Battalion Boot. Though the chic Campbell’s proffer a slightly higher heel (5”) than the luscious Louboutin’s (4.5”); for just $370.00, as opposed to the $1,995.00 required to add celebrity style to your shoe collection, they are every bit as hot to trot as their couture counterparts – and far more friendly to the frugalista’s wallet! Thanks to Net-A-Porter and Free People for the pictures. I have a feeling Jeff's boots might hold up on the street better than the expensive ones. But I can't see myself in either. This is probably not a boot for people with short legs. Wow thanks for the head's up, those Jeffrey Campbells are dead ringers for the Loubis and utterly gorgeous! Such cool boots. Oh, the cheaper one looks fantastic! Quite awesome! Yeah, for the Battalion Boot! Now those are some boots going on there. Definitely have lots of 'tude to them to make a fashion statement. The Jeffrey Campbell boots are a dead ringer for the Louboutins, I would go with those! nothing can beat the red louboutin soles! The Jeff Campbell's are so close! I will have to go with those since the CL's are considerably more expensive and not classic enough that I would wear them every day forever and ever! They're both gorgeous but I'm actually liking the gold buttons on the JC one's better! OMG i want the jeffrey camobell ones. I was just looking at those exact same boots. They're awesome, aren't they? My legs are waaaay too short for these haha. They are gorgeous though. For something this trendy, I'd for sure go with the Jeffrey Campbells! Yeah....I'm just going to stare at the Supra Fifre 120s for the rest of the day. That's it. There goes the work day. Just going to stare adoringly at these boots. It's hard to pass on anything Louboutin, but I would go with the more affordable Campell! Um, you had me at Jeffery Campbell! I can't do heeled boots anyway, haha! But $2,000 does seem a little excessive! What a great comparison! I would be tempted by the JC's! $370 is still a bit steep for me, but I am a bit head-over-heels for them. They're stunning. I prefer the style, as well as the price, of Jeffrey's shoes! oh wow those boots are crazy fab! ooo... I think I wanna go Campbell. These are SO yummy. Jeffery Campbell are yummy!! Great comparison! I would go for the cheap and cheerful . . or should I say cheaper! they are both super, super hot! They are s cute and wow what a difference in price! !